Shopping list, school timetable, forthcoming doctors’ appointments – all readily visible in many families because they are stuck to the door of a refrigerator using fridge magnets. 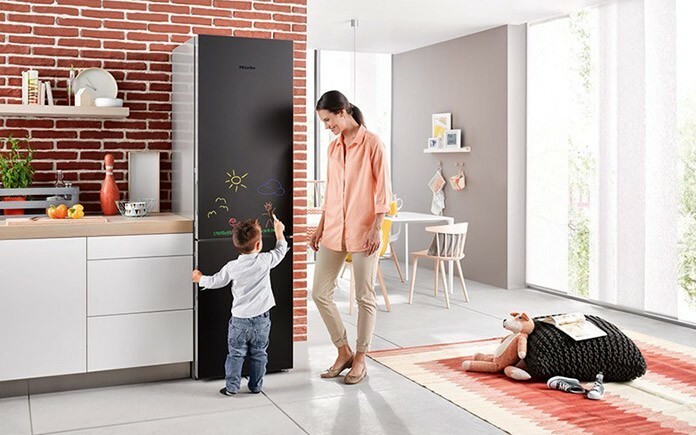 Miele now offers a solution which is as practical as it is stylish: ‘Blackboard edition’ fridge-freezer combinations offering a surface which simply invites notes and jottings. This and further door versions are the most palpable feature of the K 20.000 series, representing a range of machines with a modern design without visible handles, top-class specifications and low consumption. 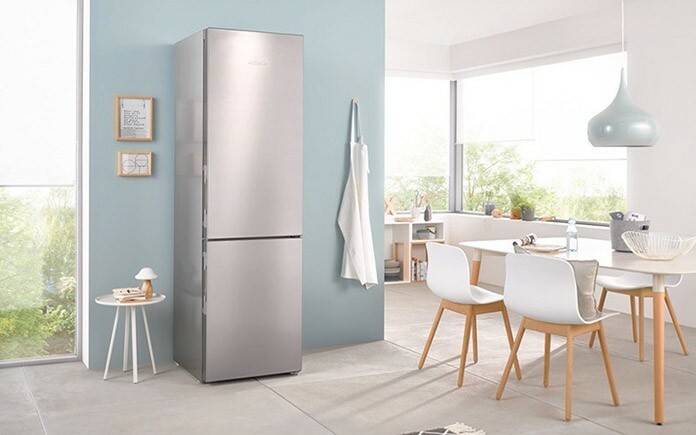 The K 20.000 series comprises refrigerators, freezers and fridge-freezer combinations. As free-standing units with heights of 125 to 200 cm, these units count among the most popular formats. All models achieve an A++ or A+++ rating for energy efficiency. And, what’s more, Miele now even offers greater value for money. ‘Thanks to a combination of high energy efficiency, elegant appearances and clever features, we forecast great market potential for these models’, says Verena Pohlmann, chief product manager for refrigeration and beverage preparation products in Miele’s Domestic Appliances International division. The door on the ‘Blackboard edition’ can be written on with school chalk or liquid chalk markers and is easy to clean. Designed above all with young families in mind, this product is part of an extensive designer range. New, too, are glossy glass surfaces in brilliant white and obsidian black. These sit alongside classic surface finishes in white and stainless steel. The models are straight-laced and puristic and therefore blend in seamlessly with contemporary, high-end kitchens. Similarly, Miele has dispensed with visible handles. Instead, a recessed handle with assisted opening action (Click2open) guarantees ease of operation, even when the door is opened several times in quick succession. For the first time, the new model series features a TFT colour display and touch controls, geared to match the design of Miele’s Generation 6000 range of kitchen appliances. Miele is also treading new ground in terms of the convenience features offered by the K 20.000 series. A tube of mustard, a small jar of spice paste or a bar of yoghurt chocolate – small items have a tendency to become lost in a large refrigerator or clutter up the door racks. Now, they can be neatly stored in a protected environment in the new ‘CompactCase’ drawer which can be conveniently housed on any of the refrigerator’s rack levels. 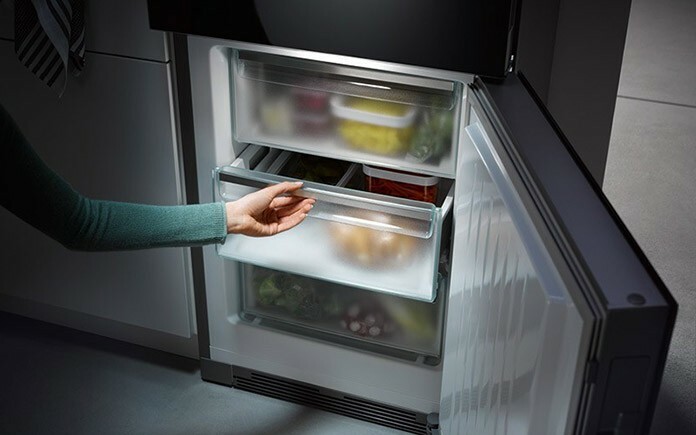 All free-standing units feature energy-saving LED lighting which – only on a Miele – slowly lights up. FlexiLight provides uniform and non-glare lighting with light sources along the front edge of glass shelves where they cannot be covered or obstructed. Thanks to side electrical contacts at each shelf level, glass shelves can easily be relocated, taking their light source with them as they go in order, for example, to create space for a large gateau. And the whole subject of lighting is rounded off on fridge-freezer combinations by freezer lighting. This is located along the lower edge of the refrigerator door, providing illumination for the drawers below. Depending on the model, a variety of systems are available which are aimed at extending the storage life of food and keeping produce fresh for longer. With the new ‘DailyFresh’ function, moisture in the vegetable drawer can be regulated separately, improving the storage of fruit and vegetables. In addition to this, PerfectFresh and PerfectFresh Pro both reduce the temperature, resulting in fruit, vegetables, meat, fish and milk products staying fresh for considerably longer. Verena Pohlmann: ‘DailyFresh sits somewhere between a conventional vegetable drawer and the ideal conditions guaranteed by Perfect Fresh and PerfectFresh Pro’.